With its popular coffee shops, retail shops, restaurants and bars, it’s hard to imagine the intersection of 14th and T streets in Northwest D.C. as anything but a bustling city corridor. But Jonathan Fain said 15 years ago, it was an “uncharted area" — until one restaurant came along. “People tended to go as far as maybe 18th Street or even 17th Street — that was kind of the emerging neighborhood — but once you got here, it was pretty sketchy,” Fain said. That is until Cafe Saint-Ex opened at 1847 14th St. NW in 2003. At the time, it was one of the only restaurants on the 14th Street corridor. Now, it’s one of dozens. Cafe Saint-Ex and its modern-day neighbors might not appear to have much in common. 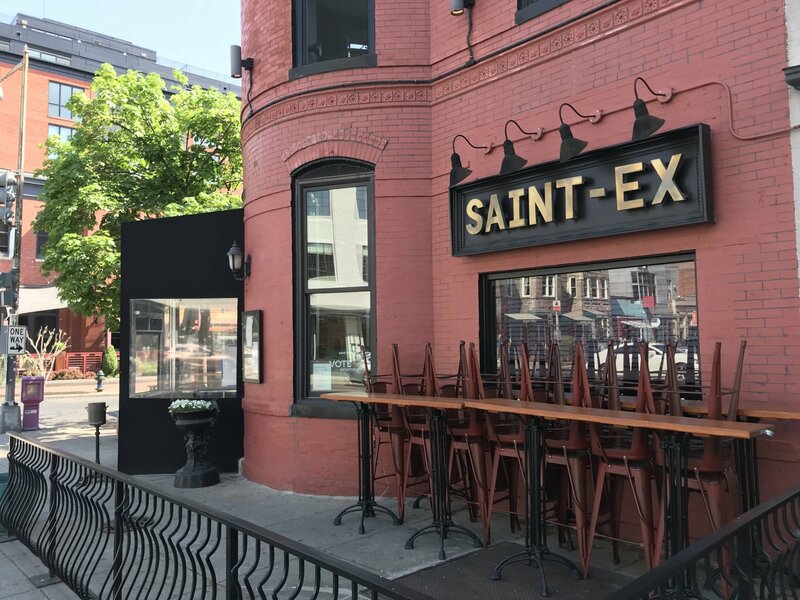 Unlike many of the newcomers, Saint-Ex doesn’t have a flashy build-out or a menu made around trends (you can always count on a good burger and a grilled cheese sandwich), but the influence it has had on its contemporary counterparts is indisputable. “Sometimes when you go to those places, you can see a slight hint of our place there,” Fain said. Several former employees have even gone on to open their own bars and restaurants — some, just down the street. And these days it’s rare to come across a concept that doesn’t have “local” or “house-made” typed on its menu. “Saint-Ex is the OG (slang for ‘original’). They are the guys that really pioneered this sort of bistro, sort of drinking spot, neighborhood spot,” Fain said. But just because Cafe Saint-Ex is the area’s anchor, doesn’t mean the restaurant has had an easy ride. Competition is stiffer than ever, and Fain said staff are constantly on their toes in an effort to stay one step ahead in a continually evolving neighborhood. “There is a charm to the place. People know that they can come here and it’s not pretentious; everybody’s welcome and they’ve been welcome for 15 years,” he said. On Sunday, May 13, Cafe Saint-Ex is celebrating its 15th birthday with a “BBQ Blowout,” from 4 p.m. to close. Attendees can purchase a $15 food wristband, which includes all-you-can-eat food from the grill on the patio, and a $15 beverage wristband for pours of Brooklyn Beer and Sam Adams. Downstairs, there will be karaoke from 7:30 p.m. until 10, and then a DJ until close. “I want the neighborhood to come back,” Fain said, referring to the upcoming party.